My Experience with SomnoGuard AP 2 - Best Mouthpiece for Men? 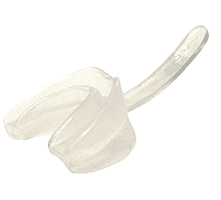 If you are like me, you automatically assume that mouthpieces that are only available by prescription are going to be superior to those you order online. After all, there has to be a good reason why they typically cost more and they are harder to get your hands on, right? Unfortunately, this is not the case. I really had high expectations for SomnoGuard AP 2, but I was really let down. 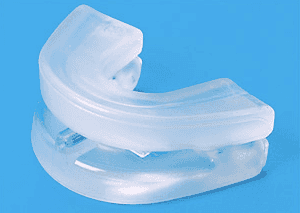 There is no such thing as a mouthpiece that will be perfect for every snorer, and like all MADs, SomnoGuard has its pros and cons. Design allows for 10 millimeters of adjustment for lower jaw placement. Air holes allow you to breathe freely through your mouth. Cleared by the United States Food and Drug Administration. Long lifespan reported to last 18 months, or longer. Allows you to move your mouth laterally. Can be separated into two pieces for thorough cleaning. Boil-and-bite process allows for a precise fit. Priced low compared to other prescription products. Larger size is designed more for a man’s mouth. It would be too large for a small female’s mouth. Bulky design is pretty invasive, even for a man. Screw adjusts lower jaw positioning, which means there is the potential to lose a moving part. Can’t be ordered with a prescription. There is no mention of a warranty or trial period, like you receive with most mouthpieces that can be ordered online. Out of all the stop snoring mouthpieces I have tried, I found SomnoGuard to be one of the more uncomfortable ones. Though I think the price is good (for a prescription device), and has a few redeeming features, I think ultimately there are better non-prescription options that I prefer. 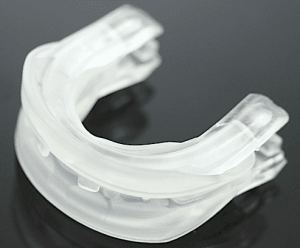 SomnoGuard is a mandibular advancement device that is designed to hold your jaw in a forward position while you sleep. By doing this, your tongue can’t collapse into your throat. Therefore, soft tissues are not permitted to get close enough to vibrate. No vibration means no snoring! SomnoGuard isn’t only marketed toward snorers; it also targets those with obstructive sleep apnea (OSA). Most oral devices do not make such claims regarding OSA, but since this appliance is only available with a prescription there is no risk of it getting into the wrong hands and used by someone with a more severe case of obstructive sleep apnea or central sleep apnea (CSA). This oral appliance is available in a few different styles, so they are supposedly more tailored to every person’s mouth, thereby making them more comfortable to wear. So, does it measure up? Is this device as comfortable as it claims? It pains me to say, it did not come close to hitting the mark for me, which I’ll explain a little while later. For review purposes, I went with the SomnoGuard AP 2. I had learned through research that SomnoGuard AP 2 is the most popular option in the line. 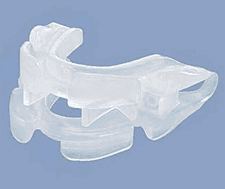 It is an adjustable, prefabricated mandibular advancement device (MAD) that uses a boil-and-bite fitting process. SomnoGuard’s distinguishing characteristics is its adjustability factor. It allows you to make adjustments up to 10 millimeters, making it ideal for individuals with both an under bite or overbite. A stainless steel screw is used to make incremental changes to advance the lower jaw to the desired position. Another characteristic that makes SomnoGuard AP 2 unique is that it allows lateral movements. This feature is said to maximize comfort. SomnoGuard AP 2 is made of a clear plastic material and barely noticeable while wearing it. One of its best qualities is that it has been cleared by the United State Food and Drug Administration. It is also one of the few MADs that has been clinically tested and proven to work. Of course, this does not mean that it will work for you. SomnoGuard AP has a breathing hole in front, so if you are a mouth breather this device will hold your mouth open slightly all night to ensure that the flow of air can easily travel in and out while you sleep. Another selling point is that it is said to last approximately 18 months. Some users have claimed that their device latest even longer. Even at 18 months this is significantly longer than most MADs on the market. Unlike my other MAD reviews, my wife did not try SomnoGuard AP 2 with me. We had read on the site that this device is ideal for those medium to large jaws, and therefore recommended more for men. My dentist confirmed this. So, since my wife is just a petit gal, I decided to do this trial alone. My dentist offered to do the fitting process with me, but since I was already very familiar with the boil-and-bite process and the instructions were self-explanatory, I just took it home to handle myself. When I took it out-of-the-box, I was immediately surprised by how stiff it was. In the picture, I had seen online the material looked a little softer. I cleaned it and completed the fitting process shortly before bed. The first thing I noticed was how invasive it was. It looks like a fairly ergonomic and comfortable MAD in the photos, but it felt like it was taking over my mouth. I drooled a lot; much more than I usually do with a new device. I was very glad that we did not buy one for my wife. I just can’t imagine how she would have dealt with wearing one. It took me a while to fall asleep the first night. I usually drift away to dreamland fairly quickly, but that first night I just watched the alarm count, constantly recalculating how much sleep I’d get, if I fell asleep at that very minute (surely you have done this yourself a time, or two). I felt really uncomfortable. I got up in the middle of the night to let our dog out for a bathroom break, and actually left the device on the kitchen counter when I got a drink of water. My subconscious may have done this purposely. My jaw was already sore. I needed sleep and there was no way I was going to fall asleep a second time with this mouthpiece in. The first morning, I was really torn. My wife said the few times she woke up, I was pretty silent. Well, at least until I decided to take it out. So, it was effective at stopping snoring, but I certainly was not looking forward to putting it back in later. Nights two and three were repeats of the first. I could not manage to keep it in through the entire night. Finally, the fourth night came, and I fell asleep pretty quickly. I honestly don’t know if my mouth was getting used to it or if was just so overly tired that nothing was keeping me awake. I also managed to keep the appliance in all night, but talk about my jaw feeling sore in the morning! This was one of those trials I was really looking forward to finishing. The product was effective, but it was just too bulky to get used it. Is SomnoGuard Right for You? Out of all the MADs, I have tried, I found SomnoGuard to be one of the more uncomfortable ones. It is just not nearly as streamlined as many over-the-counter options. If I had a really hard time falling asleep with it in my mouth, I can only imagine how uncomfortable it would be for someone not used to wearing a snoring device. If you want an effective MAD that is a lot more comfortable, I recommend that you try ZQuiet. If you are willing to try something a little different, I suggest trying Good Morning Snore Solution (GMSS), a tongue stabilizing device (TSD) that also stops your tongue from collapsing down into your throat, but it take a different approach. There are many options (Read: Zyppah vs PureSleep) and there is certainly a product that you can tolerate and will reduce or stop your snoring.